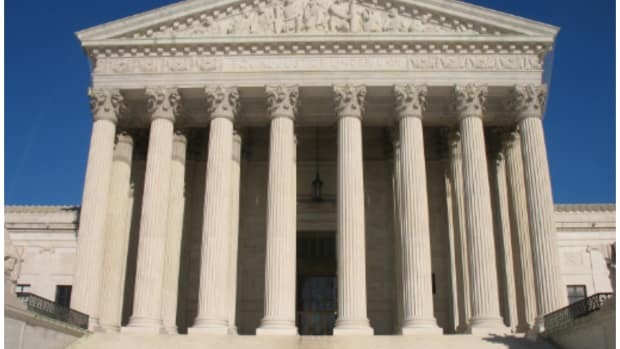 Thirteen years ago the Supreme Court ruled that companies could not be held liable for aiding and abetting fraud in private class action suits under securities laws. Regulators can bring actions for aiding and abetting, but private plaintiffs are restricted to suing the primary wrong-doer. Or, well, they were until trial lawyers invented a work-around called “scheme liability” for the restriction on their lawsuits. The theory of scheme liability is that companies should be held liable for crimes committed by business partners if they played an integral part in the fraud. So if executives at a public company defraud shareholders by deceiving them, the shareholders would be able to sue not only the executives and the company but other companies who did business with them. The Supreme Court today heard a case that will decide the fate of this clever ploy by trial lawyers to revive secondary liability. Apparently the advocates of scheme liability came in for some rough questioning. Unsurprisingly, Scalia didn’t like scheme liability. But Chief Justice John Roberts also reportedly had some harsh words for the theory, telling the lawyers that he believe the court should “get out of the business of expanding” shareholders rights. If upheld, scheme liability could have a profound impact on the way Wall Street does business. Banks would be forced to regulate their corporate clients for compliance with securities laws. It would make the process of due diligence by Wall Street firms who lend money or put together deals for corporations far more time consuming and expensive. And, of course, when business deals go bad, it would inevitably open them up to lawsuits from the plaintiff’s bar and shakedowns for settlement payments. For corporate America, scheme liability would create a duty to investigate the securities law compliance of potential business partners. “The costs of these preventative measures would be a hidden tax on the American economy and would affect our global competitiveness,” SEC commissioner Paul Atkins writes in today’s Wall Street Journal. And, he might have added, it will ultimately harm the interests of shareholders by saddling companies with new legal costs at a time when they are already burdened by too much litigation. But, you know, scheme liability is advanced by advocates of “corporate investors” and in the name of “shareholders rights.” So your not supposed to notice that it damages shareholder’s interests. Update: Peter Lattman at the WSJ&apos;s LawBlog has gone all "flood the zone" on the case. First, he comments on the PR spin of the plaintiff&apos;s bar. And files a report from a court observer who says that only two justices seemed sympathetic to the scheme liability theory. And, perhaps finally, delivers some interesting insights on who was asking the questions during the hearing.